I get it that it’s really not for everyone and actually for most people it’s not fun at all and something that they dread or makes them feel physically sick. For that reason, I’ve put together some basic tips to help you be prepared as you can should you be thrown in the deep end without your floaties, fully clothed with weights tied around your waist. 1. Prepare, prepare, prepare but…. don’t over prepare! Never do public speaking without preparation. This not only includes the on-stage front of the room presentations but also any meetings or conversations that you are having. 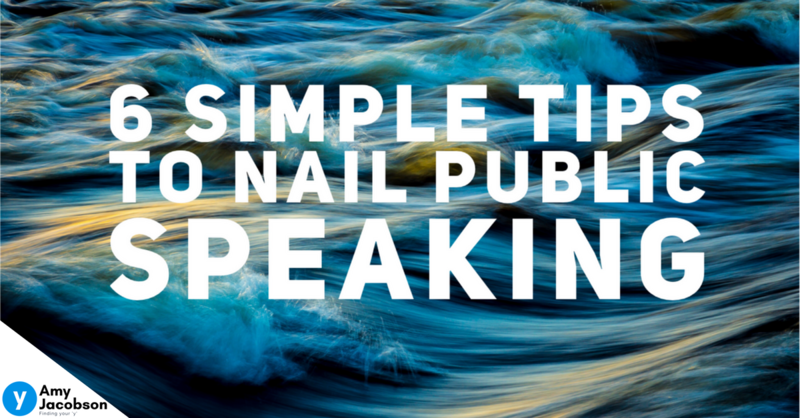 They are just as important and are public speaking as well. You need to know what you are talking about. Do your homework and make sure it makes sense to you and you are 100% onboard with what you are saying. Any small piece of doubt will be spotted instantly by your audience. Don’t deliver something you either haven’t accepted yourself yet or something you don’t know enough about. In the same tone, don’t over prepare that you become a robot delivering a message that has no passion or meaning from you. The best speakers deliver with passion and emotional intelligence. For those with photographic memories, it should be easy right? For everyone else, it then becomes an memory exercise and again you are like a robot. You aren’t speaking from the heart you are reciting a document. The minute you lose track of which word you are up to, get distracted with a question or freeze with nerves your whole speech is gone. You might as well email your guests your speech and let them read it themselves. What I like to do is write bullet points and keywords avoiding full sentences. This makes you talk in your own words in that moment. Throughout your practices you will form sentences around the keywords and bullet points but on the day it is the key words and bullet points that will trigger your memory and guide you through the presentation. Remember, no one knows what your speech says so they have no idea if you missed a line or did it in a different order. You are the only one that will know so don’t give it away by the look on your face!!! There are parts of presentations or speeches that need to be precise information like someone’s qualifications or background or a definition etc. For these moments give yourself permission with the audience to read it by saying something like ‘let’s hear all about Amy’s background’ then pick up the details and read. This shows the audience that it’s not you trying to memorise nor are they your words. Easier said than done right. Here’s some things to remember…. Everyone in the room has chosen to come and listen to you speak. They believe you have something worth listening to and in most cases they believe you are the expert or at least know more than they do. No-one wants to see you fail they are all hoping you will be amazing as much as you do. Confidence shows in the tone of your voice, the way you stand, the way you interact, what you are wearing. Get your confidence in all areas before you get started. The subconscious is so powerful. If you are thinking you will fail your subconscious will help you achieve that failure so think only positive confident thoughts and nail it! – Ok tough one, here’s what I’m thinking but let me double check that for you and come back to you. – Wow I’m really not sure of that but let me check with one of my experts in that area and come back to you. – If you happen to be presenting with someone else or there with someone who will know the answer but the question has come to you, you could say; Amy did you want to take this one? My best advice is don’t lie or try to bluff your way through the answer, that can damage your reputation. People generally remember where they got an answer not the answer itself so be the person to get them the answer, even if you have to go looking first! Reflections or reviewing how you went is a must. Have a routine for your reflection or some questions that you know you will ask yourself. What are 5 things I did really well? What are 3 things I can improve for next time? What was the biggest thing I learnt? Reflection should highlight both good and bad but the good should always outweigh the bad. We are naturally so critical of ourselves so make sure you dig deep and force yourself to find those things you did really well! This won’t be a quick fix and you need to want to do this but with commitment and ongoing practice, you might just turn that sick feeling anxiousness into excitement adrenaline!